Chloe Black (11), Madison McVicar (6), Emily McCadden (13), Allie Hill (2), Meaghan Cavanaugh (1), Carly Davis (8), and Miranda Moffett (18) return to midfield after a first half goal. 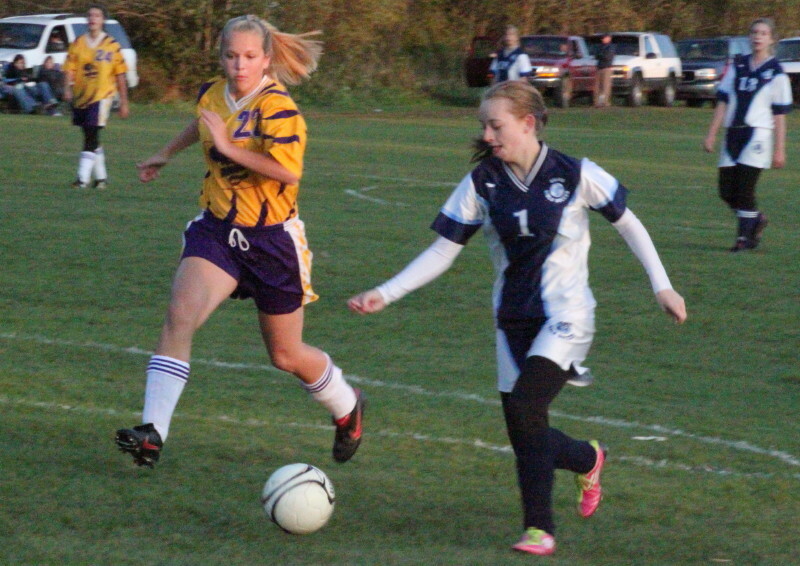 (Baileyville ME) No hats flew but there were two hat tricks registered as Calais routed Woodland, 8-1, in girls soccer on Friday afternoon at Baileyville. 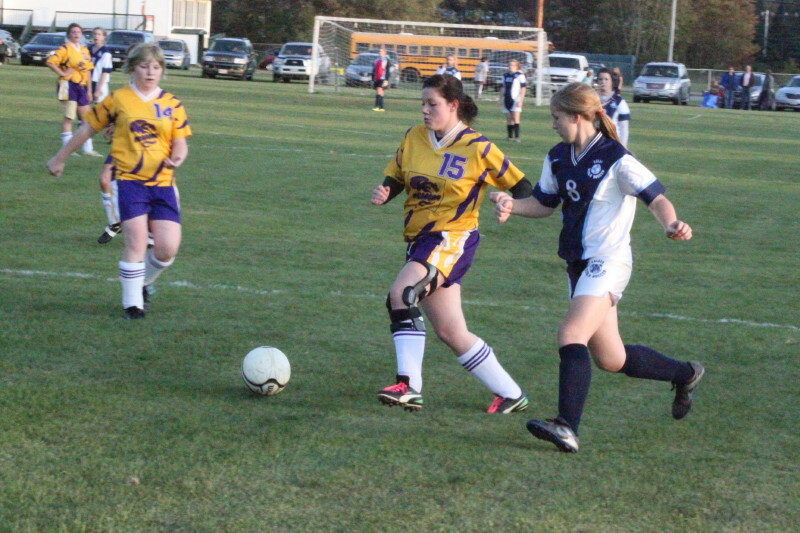 Meaghan Cavanaugh (1) had three goals for Calais. Shown here with Nicole Hanson (14). The Blue Devils had won the previous meeting this season between the two teams, 6-2, on September 14th at Calais. Calais (7-2) scored four goals in each half and had seventeen additional shot attempts that beleaguered WHS goalie Devon Perkins made saves on. Meaghan Cavanaugh and Madison McVicar each had three goals for the Devils while Allie Hill added two. 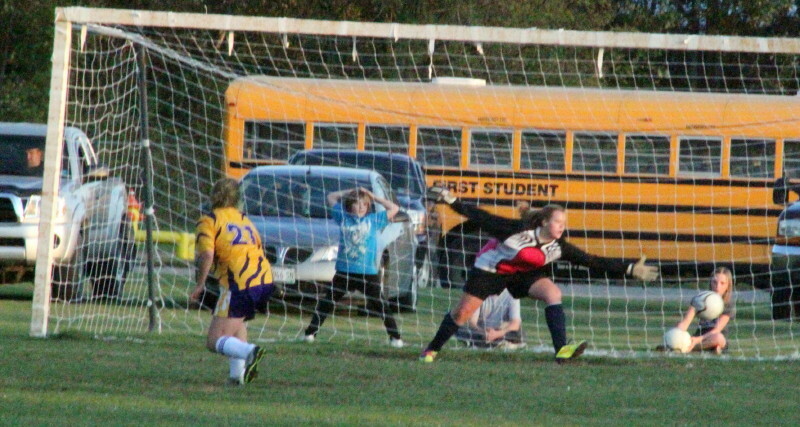 The Lady Dragon’s lone goal came from a second half penalty kick by Taylor Cochran. 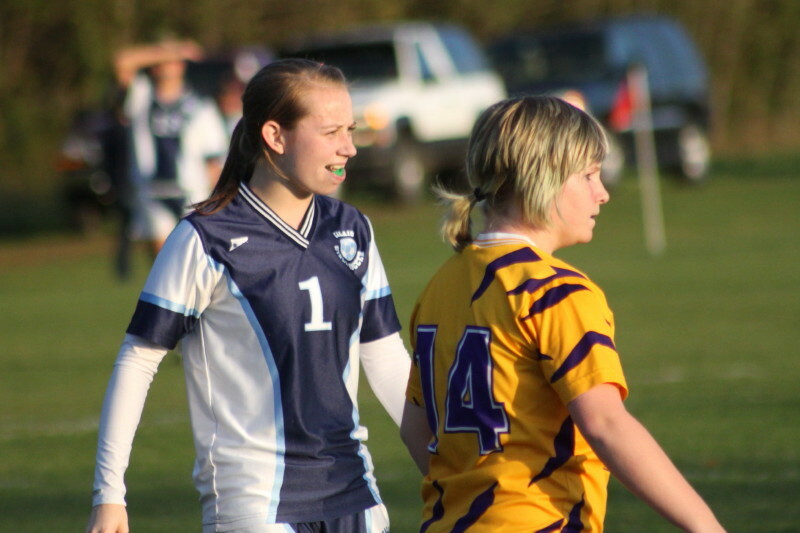 Allie Hill (2) scored two goals and dominated midfield for the Blue Devils. Woodland (4-5) surrendered the middle of the field to Calais and that gave the visitors frequent opportunities to advance the ball and find open teammates. Allie Hill, in particular, dominated the center of the field for CHS. The Blue Devils dribbled past Woodland defenders on many occasions all over the field. Meanwhile, the Lady Dragons had trouble putting consecutive passes together throughout most of the game. Credit Woodland, however, for showing plenty of enthusiasm despite facing a very good opponent. When Taylor Cochran tallied the penalty kick in the last ten minutes of the game, you would have thought, by the volume of the Woodland reaction, that they had just won the game when in fact they still trailed, 6-1. 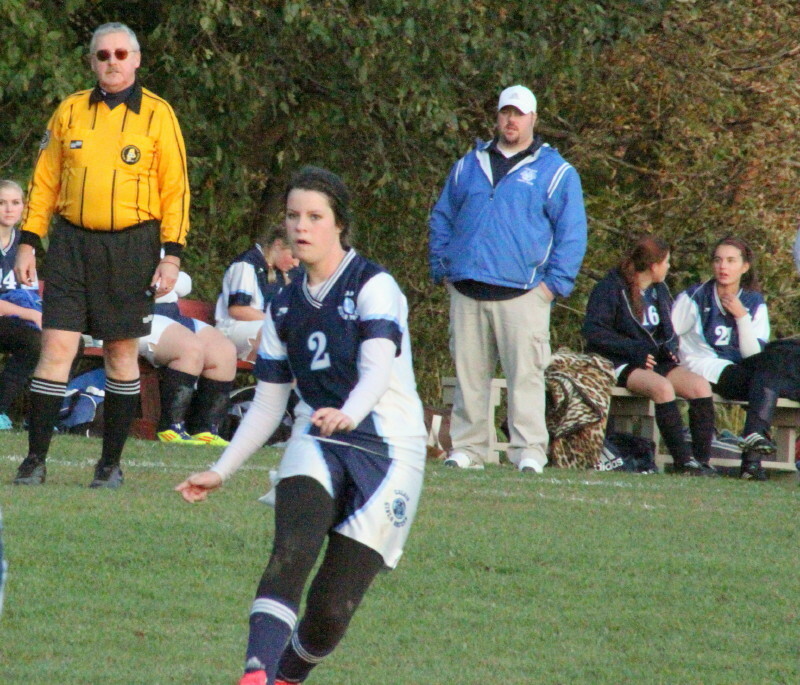 Meaghan Cavanaugh’s first goal (12:42) came as she dribbled down the middle and fired a left-footed shot. 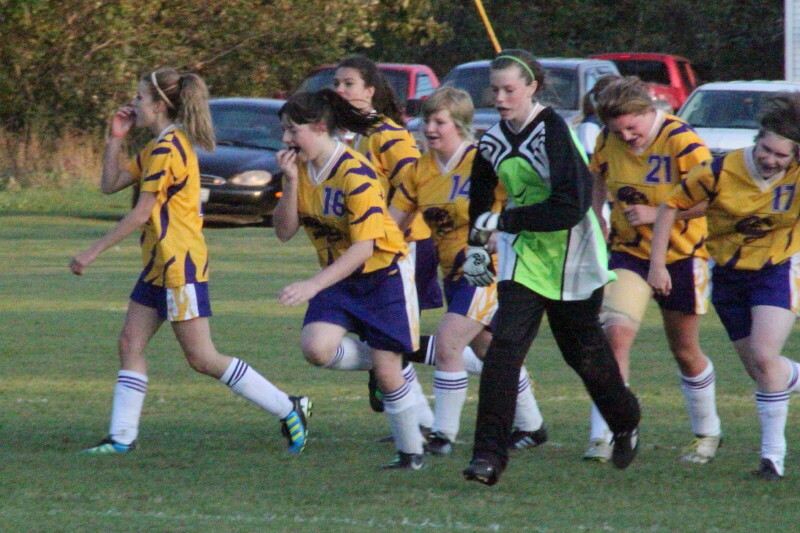 Calais’s second goal (25:00) was Allie Hill’s penalty kick to the goalie’s left. Meaghan’s second goal (33:38) was another left-footed shot from in close. 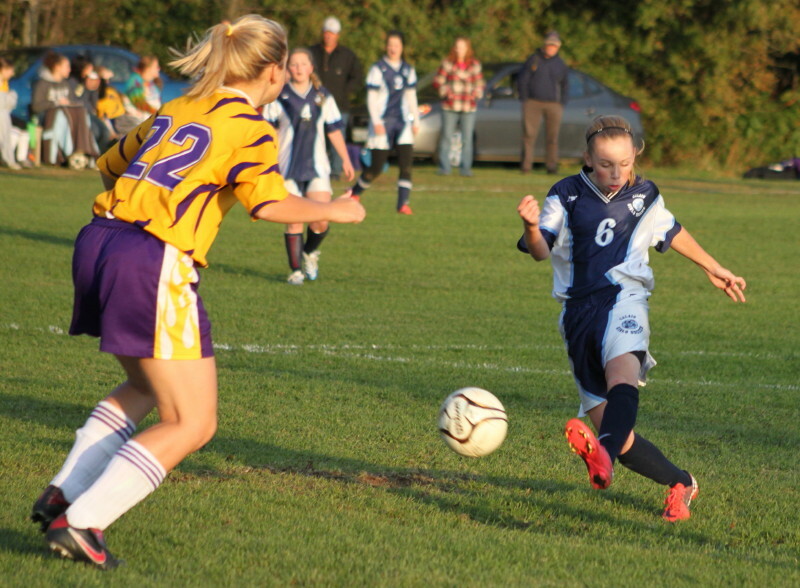 Madison McVicar (6) scored three goals. Here she shoots toward Julia Sprague (22). 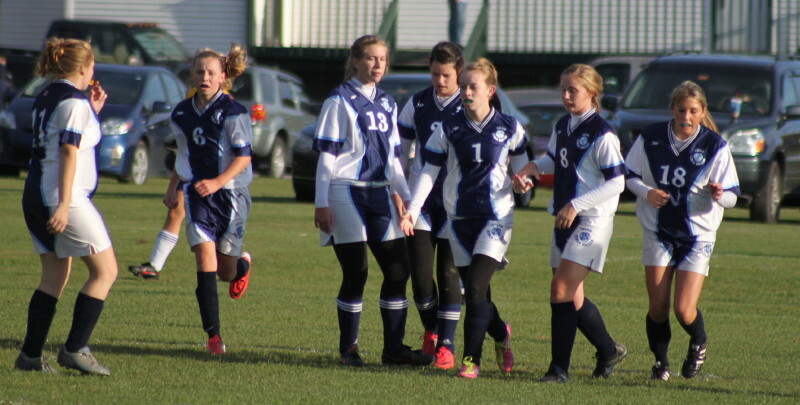 The last goal of the first half was by Madison McVicar. She took a pass from Jordan Hatch and came in on the left side. The fifth goal (3:30) for CHS, and the first of the second half, was a long shot from midfield by Allie Hill that skipped through WHS goalie Devon Parker’s legs. Madison McVicar (16:36) got a clean look to make it 6-0. Taylor Cochran (30:46) broke the ice for Woodland with her successful penalty kick. Meaghan Cavanaugh and Madison McVicar scored in the last five minutes of the game. Meaghan now has 16 goals for the season while Madison has nine and Allie six. Taylor’s goal was her sixth of the season. 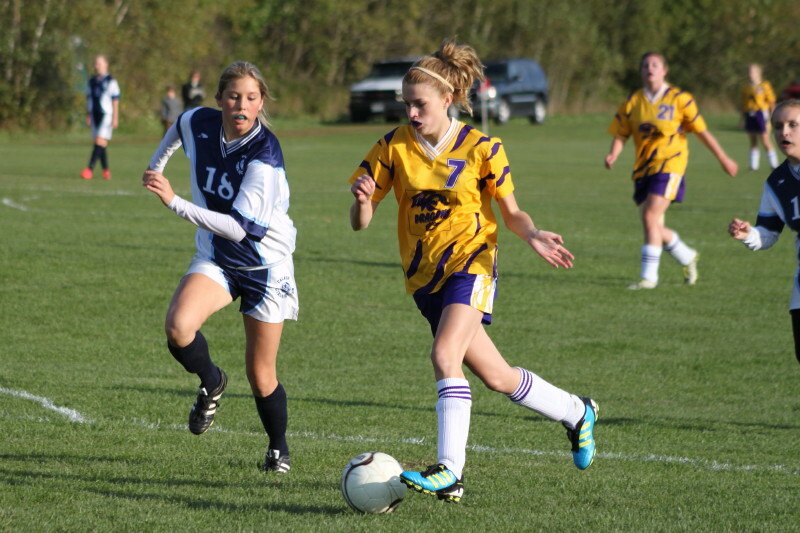 Meaghan had four goals against Woodland in the September game. 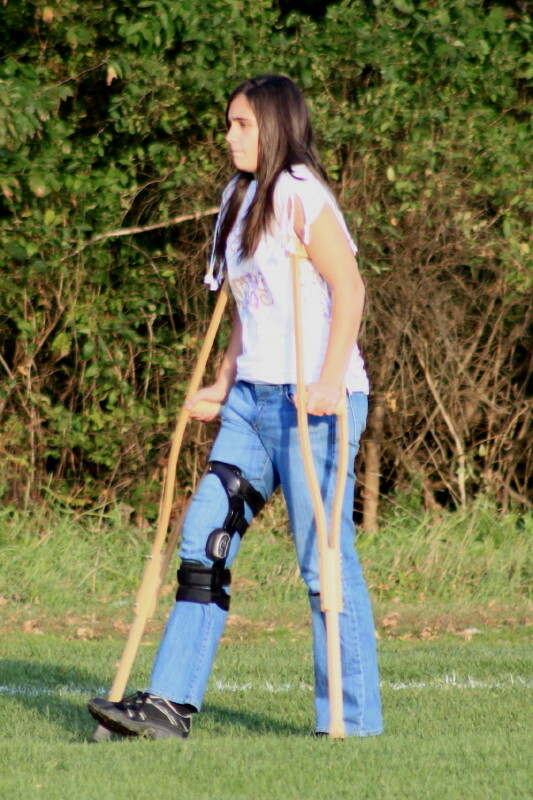 Usual Woodland goalie, Kelsey Worden, watched the game on crutches. Seeing the cars parked around the field at Baileyville was a surprise to me. I’ve been to games where no spectator is allowed along either end line. Makes it tough to get pictures. The Lady Dragon uniforms looked an awful lot like the shirts the two referees were wearing. I learned that both Calais and Woodland will have to have new home uniforms next season. I assume that the home team will have to wear white shirts in 2012. While the game was going on I heard migrating geese heading south. In addition, I heard bloodhounds barking to remind me that it is hunting season now in Maine. Clicking on any picture gets it to normal size. Meaghan Cavanaugh (1) sets to shoot. Julia Sprague (22) defends. Brittany Leighton (15) and Carly Davis (8). Hope Howard (7) with defender Miranda Moffett (18).